Russia is in a race against time to put the finishing touches to the two clusters of Olympic facilities for the country's first-ever Winter Games in the Black Sea resort that begin February 7. The president of the International Olympic Committee has warned Russia that the 100 days until the Sochi 2014 Winter Games will be the toughest period of time for organizers since preparations began seven years ago. Russia is in a race against time to put the finishing touches to the two clusters of Olympic facilities that it has built from scratch for the country's first-ever Winter Games in the Black Sea resort that begin February 7, exactly 100 days away. "You all know, like all our partners know, that these 100 days will be the toughest ones in the preparations," Thomas Bach told a gathering of Sochi 2014 volunteers at the coastal Olympic Park on Wednesday. He warned the country to brace itself for the intense media scrutiny that is inevitable in the final straight: "You will see a lot of advice coming to you, there will be many details and problems, and there will be many comments on your work," the German said. "But in these 100 days, you can work with great confidence, because what you have achieved so far is really fantastic," he added, stressing this was no time for organizers to let up. "Keep going, because we can make these Games an outstanding success and this is what we are all working for in the 100 days to come." Bach, on his first trip to Sochi since being elected to succeed Jacques Rogge last month, also had praise for the multi-colored volunteers' uniforms that were unveiled on Wednesday. "Today is a very important day. You may say it's just a presentation for the uniforms for the volunteers. But it is much more because these uniforms will be the first impression your visitors will get when they come to Sochi. They will see these beautiful colors of all 83 regions of Russia," he said. But, he joked, there was bad news for kit-maker Bosco: "I'm sorry to tell our friends from Bosco, but the uniform is not the most important. More important is the volunteers who will wear it, because it will be the volunteers who will form the image of these Olympic Winter Games. Their smile, their friendliness will be the spirit of the Games." Bach met President Vladimir Putin earlier this week, and received assurances from the Russian leader that gay people would be welcomed as warmly as any other guests to the Olympics despite his signing of controversial new legislation that bans the promotion of "nontraditional relations" to minors. 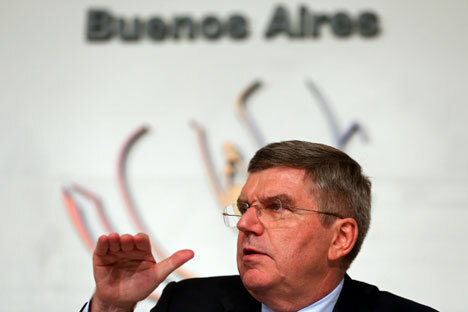 Bach is to appear at the IOC World Conference on Sport and the Environment, which runs through Friday in Sochi. First published by The Moscow News.